A trial launched at two facilities in Adelaide allows residents with limited mobility to play cricket. The six-week trial of Table Cricket run by the South Australian Cricket Association in partnership with South Australian aged care provider ACH Group aims to get participants involved in a less physically demanding version of the sport. Table Cricket was invented by UK youth charity The Lord’s Taverners and this is the first trial of the game in an aged care setting. The game has rules similar to indoor cricket and is played on a table tennis table with panels along the sides that represent the boundary and fielders. The batter is given a small wooden bat and the bowler uses a miniature bowling ramp to aim the ball onto the table. Since the end of September, residents from ACH Group’s facilities in Daw Park and Port Noarlunga have been participating in weekly one-hour sessions of the game, which includes 10 to 15 players at each table. SACA diversity and inclusion leader Matt Lucas said the trial benefitted residents by providing mental stimulation. “We find table cricket to be mentally and socially stimulating for participants and it’s a good way for some participants to be re-engaged in a cricket format,” Mr Lucas told Australian Ageing Agenda. He said the trial has allowed residents to get involved in a different version of the sport. “This is a way of bringing cricket to people who might not be able to get out and play the traditional game,” Mr Lucas said. The tabletop game has also allowed residents to have fun and enjoy the activity, he said. Assistance from ACH staff has been crucial in ensuring the program is suitable for aged care residents, he said. 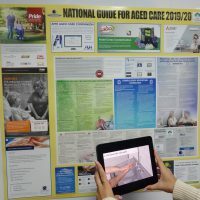 “We will continue to work with aged care workers to ensure we tailor the program to suit the participants needs,” Mr Lucas said. Mr Lucas said SACA’s vision is to make cricket the sport for all South Australian’s. “In 2019 to 2020, we would like to expand this program to more centres and form a social league or competition,” he said. He suggested residents at ACH Group could have a tournament every four weeks.